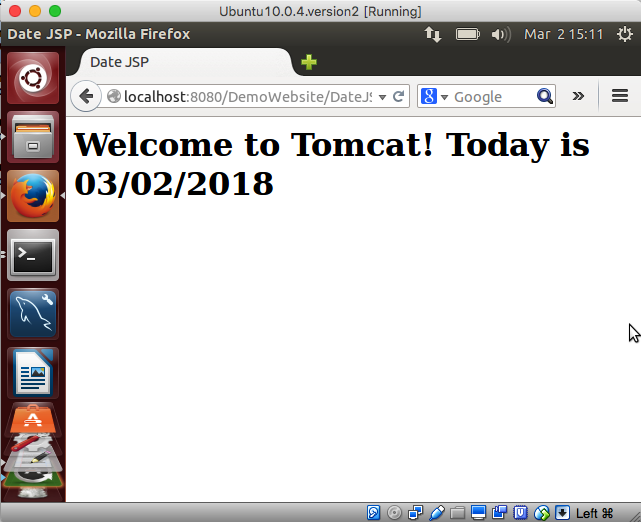 A context path in Apache Tomcat refers to the name of the website as presented by the browser. For example, imagine I tell you to enter "localhost:8080/DemoWebsite/DateJSP.jsp" in your browser. The context path is "DemoWebsite". The term "context" in Tomcat is in fact synonymous with "website". The default context path can be specified if we provide a context file to Tomcat that is given the same name as the website. In this topic, you will learn how to accomplish this important task. Create a folder named DemoWebsite under the root (i.e., / ) of the file system. The context path will be determined by the name of the file, not the path attribute value. The path attribute is only used by Tomcat if a context is placed in server.xml. Save your file as /DemoWebsite/DemoWebsite.xml. This is not a required location, but will prove convenient for referencing the file in the future. Copy the XML file to CATALINA_BASE/conf/Catalina/localhost, e.g., /var/lib/tomcat7/conf/Catalina/localhost. In the address area of the browser, type http://localhost:8080/DemoWebsite/DateJSP.jsp and submit that address to the browser.